Are you looking for themed restaurants in New York City? Most themed restaurants are a sensation and definitely one of a kind. Although these restaurants are overpriced and there are long queues to get in, themed restaurants in New York are still a big draw. Tourists hope to catch a glimpse of celebrities at these locations. Themed restaurants are themed specifically. They can be themed for one movie, or one specific genre. Themed restaurants are very touristic and are not the first choice when you want to have great food. However, for entertainment and fun they can be worth it. Ellen’s Stardust Diner is the classic American diner with a high level of entertainment. The staff sings their way through your order and your time there. It’s a unique thing to see. However, the food is not amazing, so just go there for the show. 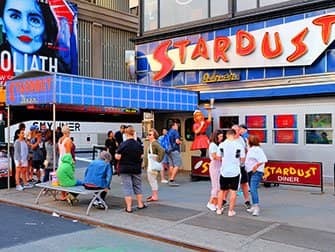 Ellen’s Stardust Diner is very popular, and there can be a two hour wait just to get in around dinner time. If you want to go there without the crowd, go there for breakfast around 08:00. 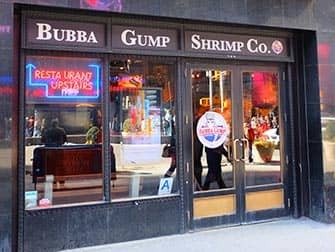 Bubba Gump, when you enter this restaurant, you will find everything you need to know about the movie ‘Forrest Gump’. You’ll also be quizzed on your knowledge of Forrest Gump and if you’re good, you might win a prize. The restaurant is always busy, but the staff works hard and makes sure you’re seated and served fairly quickly. Do make sure that you only go here if you like shrimp, because that’s prominent on the menu. This restaurant is very touristic. If you like to rock, go to Hard Rock Café. With 708 seats, the Hard Rock Café in New York is one of the biggest. The café is filled with a collection of items from rock-legends such as The Beatles, Nirvana, The Ramones and so on. 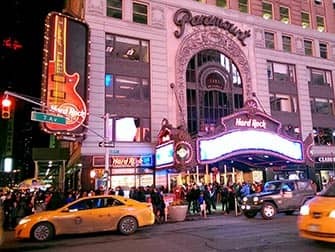 What’s unique about this Hard Rock Café is that they also have a collection of items from rock legends that have ties to New York. Like John Lennon for example. Once or twice a day, the whole HRC team gathers to dance to Y.M.C.A by Village People and invite everyone in the room to dance along. Tip: Don’t leave HRC New York without trying one of their typically American desserts, the apple cobbler. You won’t regret it! You can also book a 2 or 3-course meal with various themes like Blue Grass, Hip Hop or Rhythm and Blues. All menus include one non-alcoholic drink and a dessert. For children there is a Lil Rocker menu. Jekyll & Hyde, doesn’t that make you think of horror stories? Are your nerves made of steel? Are you sure you don’t get scared easily? 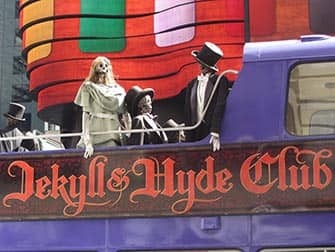 Then take the test at the haunted restaurant: Jekyll & Hyde Club. This mansion is filled with actors who will try to scare you. The decoration is, as expected, horror-themed. The food here is pricy, but the entertainment surely is worth it. No reservations are needed. Planet Hollywood: the name says enough. Enter and you’ll find yourself into a new world of movies! Everywhere where you look you’ll find quotes and items of your favourite movies. This restaurant, which is owned by Arnold Schwarzenegger, will surely make you curious about what else there’s to see. This place is fun for kids as well as for adults and the menu is big enough to find something delicious for everyone. Don’t be taken aback by the queue for the restaurant, it’s worth the wait. The Ninja restaurant is more than a restaurant, it’s almost like a mini trip to Japan. Ninjas will be everywhere, trying to scare you as you pass by. However, it’s not only about the thrill: if you love Japanese cuisine, you’ll love the food they serve here. You can only eat at this restaurant if you make a reservation beforehand.